I'm about to dive into a new semester at North Park, and it leaves me suddenly with a lot to write about. I'll try to report new textbooks as they arrive via Amazon love (though there are a few sitting in boxes that I refuse to open because I haven't yet made shelf space). I haven't finished writing thoughts on Christianity and culture. And I've committed to attending a gathering through the new Ecclesia network to see my friend JR Woodward and hear thoughts from that crazy Australian pastor Alan Hirsch. Hirsch's most recent book is The Forgotten Ways: Reactivating the Missional Church . 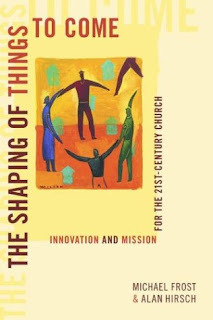 But I haven't yet read his previous book in conjunction with Michael Frost: The Shaping of Things to Come: Innovation and Mission for the 21 Century Church . So knowing that he'll probably talk about his newer thoughts, I'm going to get his foundational ones first. My interest was peaked by my friend Ty, who has read both and probably had told me half of the concepts in conversation anyway. That said, I plan on noting quotes from the book along the way. Like this, three key parts of their definition of missional church thinking (p12). 1. The missional church is incarnational, not attractional, in its ecclesiology. By incarnational we mean it does not create sanctified spaces into which unbelievers must come to encounter the gospel. Rather, the missional church disassembles itself and seeps into the cracks and crevices of a society in order to be Christ to those who don't yet know him. 2. The missional church is messianic, not dualistic, in its spirituality. That is, it adopts the worldview of Jesus the Messiah, rather than that of the Greco-Roman empire. Instead of seeing the world as divided between the sacred (religious) and profane (nonreligious), like Christ it sees the world and God's placein it as more holistic and integrated. 3. The missional church adopts an apostolic, rather than a hierarchical, mode of leadership. By apostolic we mean a mode of leadership that recognized the fivefold model details by Paul in Ephesians 4 a. It abandons the triangular hierarchies of the traditional church and embraces a biblical, flat-leadership community that unleashes the gifts of evangelism, apostleship, and prophecy, as well as the currently popular pastoral and teaching gifts. a. footnote on Ephesians 4. It actually reads Ephesians *6* in the book. Not sure why, I can only assume I missed something or it's a genuine misprint.